Futures closed 1.3 per cent higher in New York after Saudi Energy Minister Khalid Al-Falih told the Financial Times that the kingdom will continue to curb output more than required by a December deal among top producers. Prices got another boost in after-hours trading as an industry group was said to report that U.S. crude stockpiles declined last week. “As if on cue, Saudi Arabia’s energy minister has injected a hearty dose of bullish impetus into the energy complex,” analysts at PVM Oil Associates Ltd. said in a report. Developments in Washington, meanwhile, signaled progress on two controversies that have dogged the global economy for months. Trump on Tuesday said he was open to postponing a March 1 deadline for increasing tariffs on Chinese products if talks between the two countries make headway. He also said he may sign a proposed agreement on border security and avoid a government shutdown even though he’s unhappy with the deal. Crude’s rally had fizzled in February on concern the U.S. and China won’t be able to defuse their tensions. A strengthening dollar has also hurt the appeal of commodities priced in the currency. Prices have shown a dwindling response to the output reductions brokered in December by the Organization of Petroleum Exporting Countries and its allies. More bullish news for prices came late on Tuesday. American Petroleum Institute data showed oil inventories fell by almost 1 million barrels last week, according to people familiar with the report. That would be the first drop in a month, if confirmed by official statistics due Wednesday from the U.S. Energy Information Administration. Analysts in a Bloomberg survey had projected a 2.5 million barrel increase. West Texas Intermediate crude for March delivery rose 69 cents to US$53.10 a barrel at the official closing of the New York Mercantile Exchange. It advanced to US$53.33 at 4:52 p.m., after the API report. Brent for April settlement closed up 91 cents to US$62.42 a barrel on the London-based ICE Futures Europe exchange and was at US$62.58 after the report. Al-Falih said Saudi Arabia would pump about 9.8 million barrels a day next month, lower than the limit it agreed to in December’s OPEC+ agreement. OPEC’s 14 members already saw production fall by almost 800,000 barrels in January, the cartel said in a report Tuesday. OPEC’s secretary-general nonetheless issued a statement Tuesday nudging other members to keep up their end of the cuts. 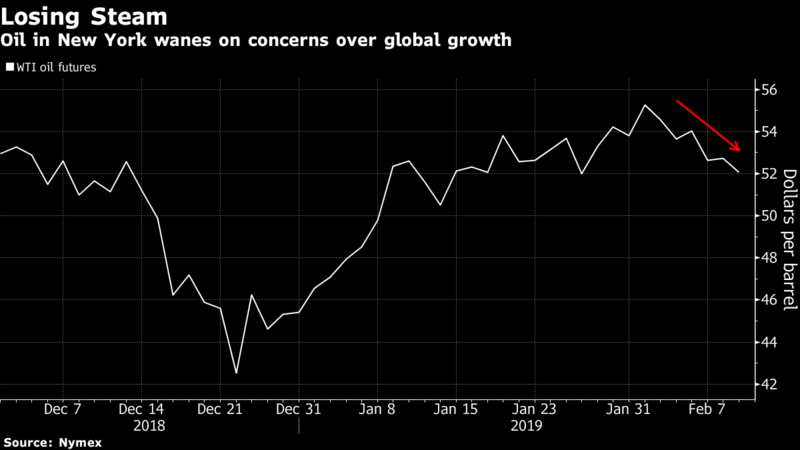 “OPEC’s overall production being down has refocused the market’s expectations around tightened supply," said Gene McGillian, a senior analyst and broker at Tradition Energy in Stamford, Connecticut. “Whether or not we have enough strength to make a return to recent heights of US$55 remains the question." Other oil-market news: Gasoline futures climbed 0.6 per cent to close at US$1.4272. The U.S. Energy Department upped its estimates for American crude production this year and next, highlighting OPEC’s dilemma as it tries to revive prices. Chevron Corp. CEO Mike Wirth pledged to work closely with the U.S. to remain in Venezuela despite a spiraling crisis that has led rival oil major Total SA to retreat. Forces loyal to Libya’s eastern leader Khalifa Haftar have taken control of the country’s biggest oil field and say the area is ready to resume production.